The unloading, setup, and reloading would wear me out! I saw something similar in Mammoth Lakes CA. The guy had a side by side 4 wheeler on a ramp that went over the cab. Pretty cool and well executed arrangement. 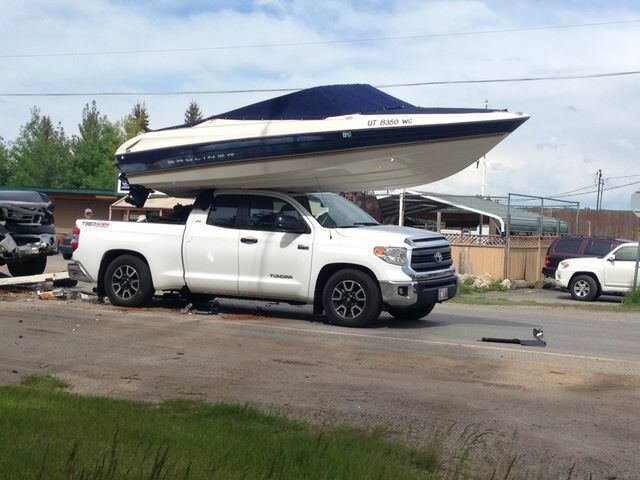 I've seen a boat on trailer attached behind a 5th-Wheel camper trailer pulled by a pickup truck. Apparently that is legal in some states. Actually, this kinda makes sense. Once you get to the campground, you just leave the camping trailer there, then pin the trailer and boat to the pick-up and go to a remote lake, then come back to the campground for dinner. I didn't get a picture but I saw a guy in a state campground a few years ago towing a 5th wheel with a trailer behind which carried a Bass boat with motor, 2 bicycles, 2 ATV vehicles and 2 kayaks and he actually managed to back it into a site. In speaking with him, he was a retired long haul 18 wheeler driver. B trains aren't legal everywhere, but pray many of those drivers don't need to back up into a spot. Where are the Jet Skies? Can't make this up either - it showed up on my Instagram feed the other day. Similar configuration but with less intent behind it (rear-end collision). Via FOX News somewhere in Utah.